No. 4 seed Virginia Tech overcame an 8-point first half deficit to defeat No. 12 seed Liberty 67-58 in the NCAA Tournament. With the win, the Hokies improved to 26-8 overall and advance to the Sweet 16 for the first time in the modern era. The 26 wins marks a school record. The Flames finished the season with a 29-7 record, also setting a school record for wins. 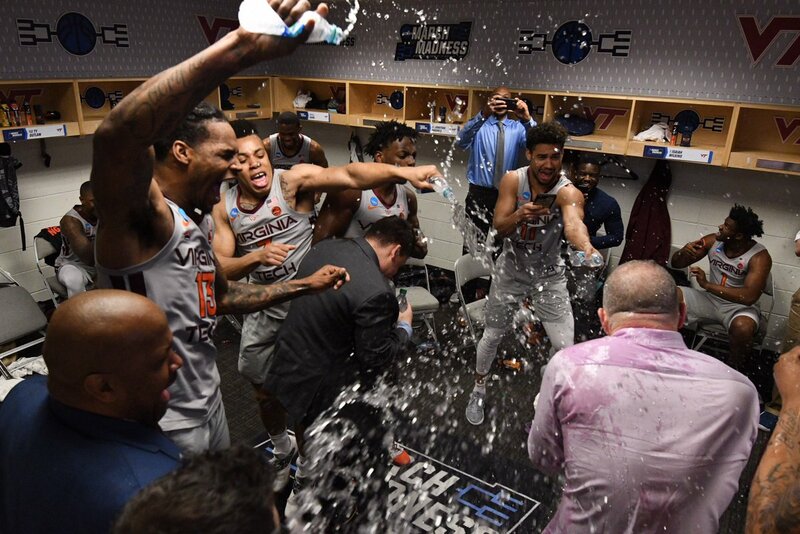 Exactly five years to the day since he was hired as Virginia Tech’s head coach, Buzz Williams has the Hokies in the Sweet 16 for the first time since they made the Elite 8 in a 23-team field in the 1967 NCAA Tournament. Williams has also guided the Hokies to the NCAA Tournament for three consecutive seasons for the first time in program history. He also picked up his 100th career win at Virginia Tech on Sunday. Things weren’t easy for the Hokies, particularly in the first half. Tech struggled to knock down jumpers early in the game, missing five of their first six three-point attempts and several other shots that they are capable of making. Virginia Tech trailed 26-18 with 4:29 remaining in the first half, but then started playing better at that point. First Kerry Blackshear was fouled while making a shot, and he converted the free throw to make it 26-21. Then Justin Robinson hit a corner three to make the score 26-24 with 2:09 left. Blackshear then completed the 8-0 run to tie the game at 26 with a shot in the paint with 1:40 remaining. However, the Flames didn’t back down. They went on their own 6-0 run to retake the lead 32-26, but the Hokies closed the half strong when Justin Robinson found a wide open Ahmed Hill on the wing for a three-pointer at the buzzer to make the score 32-29 Liberty at halftime. Virginia Tech shot just 10-of-28 (37.5%) from the field in the first half, while Liberty was 12-of-25 (48%), including 7-of-18 (38.9%) from three-point range. Those shooting numbers would be flipped in the second half. The Hokies began the second half on a 7-0 run to take a 36-32 lead. The run was capped by an Ahmed Hill three-pointer from the corner with 17:49 remaining. Liberty did rally to retake the lead by as many as five points, 41-36 with 15:21 remaining, but on the whole the game was turning in Virginia Tech’s favor from the closing minutes of the first half. Trailing 41-36, the Hokies embarked on a 16-3 run that saw them take control of the game for good. Ty Outlaw opened the run with a three-pointer, and after a Kerry Blackshear shot, Outlaw again nailed a three-pointer to tie the game at 44. Then the Hokies ran off eight consecutive points to finish the run, with a layup by Justin Robinson putting Tech up 52-44 with 10:20 remaining. With 7:36 left in the game, Scottie James hit a pair of free throws for the Flames to cut Tech’s lead to 52-49. However, the Hokies clamped down defensively, and Liberty did not score again until a Caleb Homesley layup with 3:26 remaining. Though Tech didn’t score a lot themselves during that span, they did lead 56-50, and that key defensive stretch was enough to keep the Flames at arm’s length. The key play down the stretch came with 3:13 remaining, with Tech clinging to that 56-50 lead. From an inbounds pass under the basket, Justin Robinson threw up a lob to Hill, who put it in the hoop and drew the foul. After the free throw, the Hokies led 59-50, and the Flames couldn’t get it any closer than five points in the final minutes of the game. Kerry Blackshear and Ty Outlaw made a pair of free throws each in the final 40 seconds to clinch the win. Liberty was just 6-of-22 (27.3%) from the field and 3-of-13 (23.1%) from three-point range in the second half. Meanwhile, the Hokies were 14-of-29 (48.3%) overall, 4-of-8 (50%) from the outside, and 6-of-7 (85.7%) from the free throw line in the final 20 minutes. For the game, Liberty was just 10-of-31 (32.3%) from three-point range, while the Hokies were a much more efficient 7-of-16 (43.8%), despite starting 1-of-6. Virginia Tech also forced 12 Liberty turnovers, including seven in the second half. The Hokies committed only seven for the entire game. Kerry Blackshear led Virginia Tech with 19 points, and he also pulled down nine rebounds. He was 8-of-19 from the field despite a tough start. Ty Outlaw finished with a double-double, scoring 10 points and pulling down 11 rebounds. Senior point guard Justin Robinson played much better in his second game back, scoring 13 points and dishing out four assists in 29 minutes. Ahmed Hill had 14 points and two steals. Virginia Tech will face No. 1 seed Duke on Friday night in Washington, DC. Tip-off is scheduled for approximately 9:39 PM, or 30 minutes after the LSU-Michigan State game ends. It’s time to insert JRob back into the starting lineup. He’s our unquestioned leader and tone-setter, he gives everyone else confidence, and puts us in the best position for success. Let him play 40 minutes if he’s up for it. It may be our best hope for taking down Zion & co. Can’t wait for Friday! Oregon is going to be a handful for UVA. Payton Pritchard leads an exciting and athletic squad that is peaking at the right moment. I too was very nervous we wouldn’t seize the opportunity and demonstrate our preparation for the moment. Like someone else posted above….I am looking for NAW to come out of last games funk and play like an assassin next game. We are going to need all 5 of our best players playing in perfect harmony with each. This is Duke and Coach K we are talking about with a bid to the Great 8 on the line…….Hopefully we will be ready. They certainly will. Here’s a link to the bracket from 1967. 2 games at Cassell on March 11, 1967 which I attended. Thanks for sharing that. Wow! Dayton really had a charmed run. I watched that Dayton game on TV. Heartbreaking end. Missed a tough tip (I believe Perry Young) that would have won the game in regulation. Not very much unlike the tip by Central Florida at the end of the Duke game last night. They had a guy named May (I think) that we just couldn’t stop. All we need to do now is win the next four games. It never felt secure until near the end. Liberty had grit and talent. Not sure VT wins w/out “Five” coming back to near early-season form. Second half looked great. But NAW continues to miss some layups .. looking for him to regain confidence and shooting magic. KJB a rock throughout. Outlaw’s threes finished strong. Great news! The “Elite Eight” as a term didn’t exist in 1967. It was just the quarterfinals of the tournament. Yep, no “Elite Eight” in ’67. Also, no “Big Dance”, “Sweet Sixteen”, “Final Four”. I am not sure how we got along w/o all those terms! great victory and nice analysis of the game……………… yes a little tense the last 4 minutes of game. two good defenses ………….. Pulling for Virginia Tech & Oregon next weekend! Should be free throw, not layup. Fantastic season! Let’s keep Dancing!! !